The hero of the 1989 science-fiction film "Back to the Future II" famously rode a floating skateboard to escape his enemies, inspiring real-world engineers to try to build one. On Wednesday, Toyota's Lexus luxury division teased a video about the Slide, a prototype board that hovers several centimeters off the ground. The promo video on YouTube shows the Slide emitting wisps of steam just below its bamboo surface. Its ends are slightly upturned like those of a skateboard. The Slide can hover through magnetic levitation created by superconductors, a Toyota spokeswoman said. A cryostat, which is a device to maintain very low temperatures, cools liquid nitrogen in the hoverboard and that keeps the superconductors cold. When that happens, the superconductors create electrical currents that can repel magnets, allowing the board to float and move without friction. Operated like a skateboard, the Slide doesn't require batteries or a power supply but does need magnets on a rail embedded in the ground to work. The device is not for sale, but will be tested in Barcelona over the coming weeks. The hoverboard is the latest in Lexus' Amazing in Motion series of projects, which have including palm-sized quadrotor drones that can move in unison. 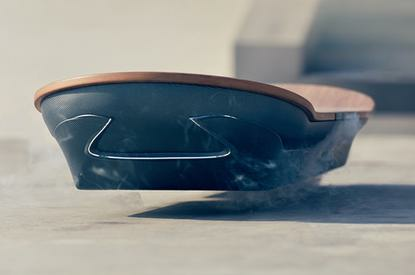 There have been various designs for hoverboards in recent years, including the Hendo Hoverboard, a prototype announced by a California startup last year that uses magnets to float over a surface plated with copper. The project drew thousands of supporters and raised over US$500,000 on crowdfunding site Kickstarter. Hoverboards drew increased attention last month after a video of Catalin Alexandru Duru earned him a Guinness World Record for a hoverboard flight of 275.9 meters above a lake in Canada. The feat involved a lightweight, battery-operated board that somewhat resembles a drone. It incorporates eight powerful rotors that lifted the inventor to a height of 5 meters above the water.